Check out this badge. I came across it in the Lowell Historical Society’s vast archive, located in the city’s Boott Mills complex. As the society’s newly-appointed Curator of Art and Artifacts, I got to spend some time with the badge, recently, and other items that came with it. 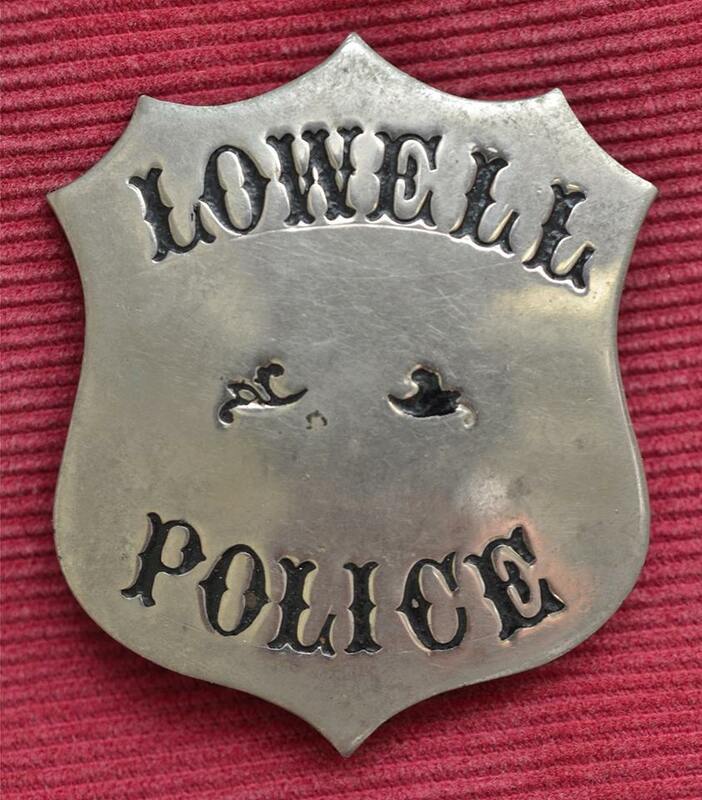 The badge, it turns out, comes from William G. Lee, a patrolman with the Lowell Police Department who retired from the force in 1948, after 37 years of service. The Society also has Lee’s billy club and his policemans’ rule book in its collection. Like all old stuff, the badge, club, and book all have a kind of magic to them. I mean, face it. Old stuff like this invokes a certain fascination within all of us. It’s one of the reasons societies like the Lowell Historical Society exist, and why they have an archive in the first place. Maybe that sense of wonder carries forward from our first years, when we escaped into our grandparents’ attics as children and found Victorian punch bowl sets wrapped in yellowed newspapers, or a stack of colorful magazines from the decade before we were born. Most of those things are gone now, disappeared into landfills, into firepits, into oblivion. Unless we saved them, or donated them to an archive. That’s just how the badge, the club, and the rulebook made it to the Lowell Historical Society’s archive. Almost 20 years ago, Officer Lee’s daughter donated them so that they could be maintained, and shared with future visitors to the Society’s archive. Touching history is a pretty cool thing. Sure, you can read about history, watch it on TV, or even apply your imagination to it. But touching history brings it to life. And that’s the great thing about archives. You can touch history. As the Lowell Historical Society’s Curator, one of my duties is to publicize the collection, and share some of the stories I encounter as I research its items, and help bring the society’s vast holdings to life. When you first set about researching an artifact, there’s that initial wave of information you instantly find, the low-hanging fruit, so to speak. Sometimes, it’s the most interesting. Often, it’s not. 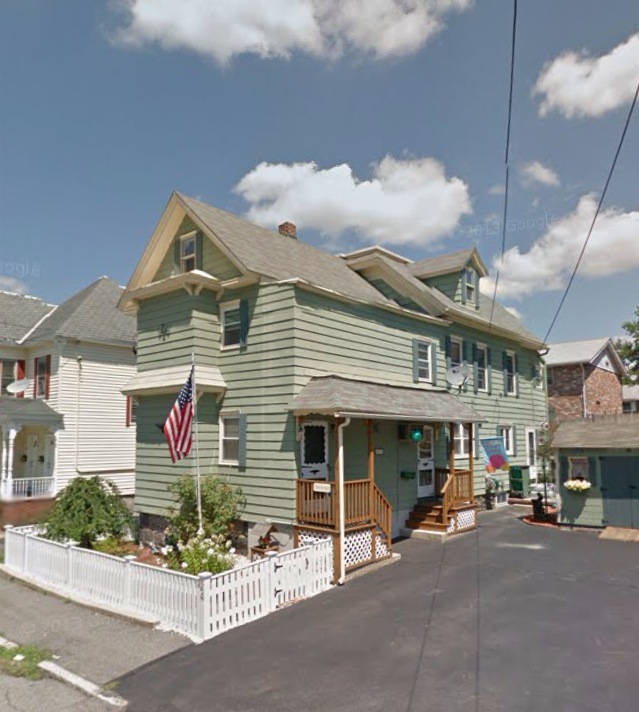 A quick search on William G Lee shows that he lived at 24 Canton Street in Lowell in June 1948, when he retired from the force. From the note that came with the badge, I also learned that he was appointed to the department’s probationary force in May 1911, and was promoted to the rank of patrolman about five years later in September 1916. What’s really interesting, though, is the next few waves of discovery that you come across as you research a piece. And it turns out that Patrolman Lee received some commendations during his 37 years on the force. A quick glance through Lee’s rulebook reveals that patrolmen, while making their rounds, weren’t allowed to walk together, or even talk with one another. They were advised not to stay in one spot, or converse with anyone, unless it was in the line of duty. But, a little more research into Lee’s career proves that it’s good that he didn’t always follow his rulebook to the letter. While he was wearing that very badge pictured above, Lee stood at the top of Dummer Street early one day on February 13, 1922, talking with fellow patrolman William Liston. It wasn’t even four in the morning, when he and Liston first saw the flames and smoke bursting from the windows of a dry goods store on the ground floor of a building housing eight tenements. Lee ran at once and pulled the alarm on a nearby fire box, while Liston ran to the burning tenement at 67 Dummer Street and started to rouse its residents. Lee soon joined. 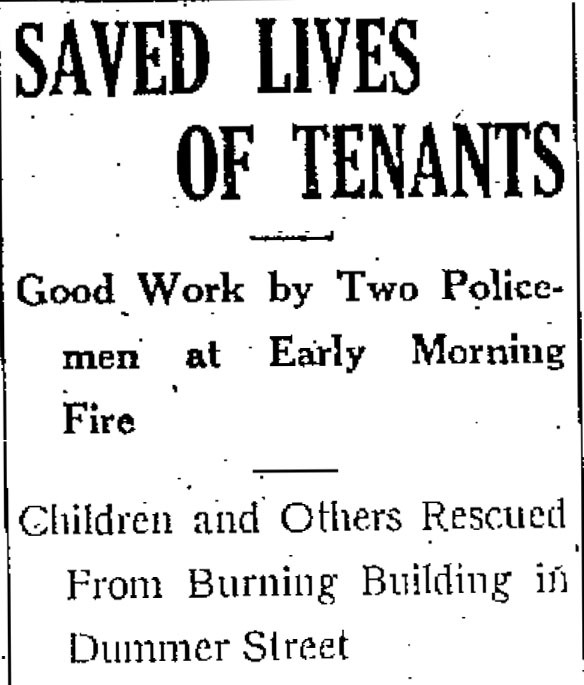 They, with the firemen who soon arrived, entered the building and awakened the tenants who lived on its three floors. Everyone escaped unharmed, and the men carried three children out of the fire to safety. Three years later, Lee received a commendation again, when he made an arrest in the early morning hours of January 26, 1925. 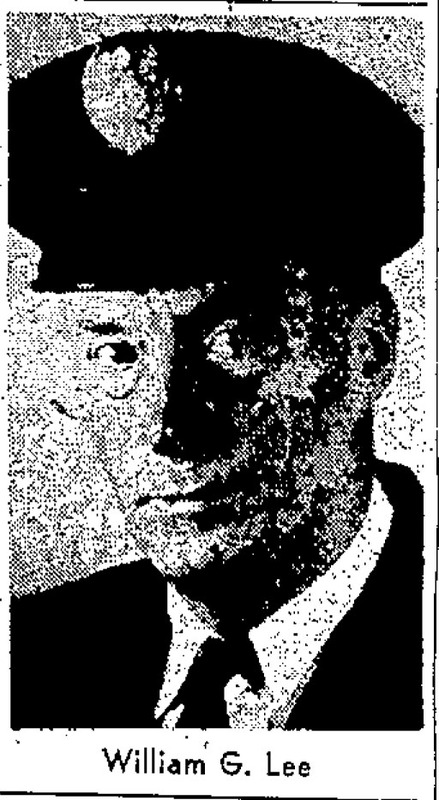 While likely carrying the very billy club that now rests within the Society’s collection, Lee arrested Edward Cole, a 32-year-old Lowell man who was wanted for breaking and entering into a Londonderry, NH hen house some two months earlier. How did Lee find Cole? He happened upon him while Cole was trying to crack a safe at the Colonial Filling Station on the Pawtucket Boulevard. How did Lee treat his prisoners? Luckily, we have his rulebook to shed some light on this. The book advised that prisoners “shall be made as comfortable as possible,” and reminded officers that they were entitled to clear water. The water could be purchased using the prisoners’ own money, the book continued, but only if that money hadn’t come from the offense for which they had been arrested. Even if it turned out that the prisoner was broke, the police officer could purchase the refreshment from his own money, get a receipt, and get reimbursed for these expenses once monthly. Officers were required to check on their prisoners once every half hour, but were strictly forbidden to “bandy words with prisoners” or to speak to them unnecessarily. The book also stressed that the use of obscene or profane language was prohibited. Lee’s guidebook also provides a glimpse into the daily life of patrolmen. The book specifically reminded policemen that they were to look for anyone of ‘known bad character’ and that it was their duty to seek out disturbances and to restore quiet. They were also encouraged to evaluate anyone who he saw walking Lowell’s streets after 10 PM. In making his rounds, we also learn that Lee ensured that Lowell’s sidewalks remained unobstructed, and that he was to gauge the purpose of anyone he saw selling door-to-door. Lee was also responsible for checking the doors of all dwellings upon his route to make sure that they were properly locked. While Lee was fulfilling these same duties, in March 1933, he found Mrs. Sofie Boumilla, 37, on the floor of her unheated Cady Street home, weak and nonresponsive. She had spent the night before on her floor, suffering with a broken leg. She had fallen on the sidewalk on Chapel Street at 6:30 PM the prior evening and had dragged herself home, nearly half a mile away. A neighbor who heard the woman’s weak moaning summoned Patrolman Lee who entered the home and rescued her. The badge, billy club, and police rulebook are just a few of the many historical treasures that form the holdings of the Lowell Historical Society’s archive. The LHS has been in existence for years, and traces its roots to 1868 when it was founded as the Old Residents’ Historical Association. In the coming months, I’ll be writing regular posts researching some of the many interesting items held by the Society and trying to find some of the forgotten history behind the Society’s art and artifacts. Great article!! Looking forward to what you find on LHS. Graduated from there in 1952. Hi Jean, thanks! I’ll see what I can find. My dad graduated from there in ’53. Does the rule book by any chance have the locations for the police call boxes? I have one of the original cast iron city of Lowell call boxes and have tried in vain to research it’s location. I’ve checked the old city directories at the library and they only list the fire alarm box locations. Thanks. I think it might. I’ll be at the archive again soon and will check. Great article on artifacts and connecting them with the people that owned them. I would like to know more about the holdings at the Lowell Historical Society. I’m doing research about several sheriffs from Lowell. If you have an email please forward it to me. Thanks Maria. You can reach me at forgottennewengland@gmail.com.